Out of sheer frustration I've sketched my own proposal. I wonder if this has a better chance than what has already been put up by the politicians/experts. As this isn't UBAT/BaT/CRR but a proposal I have used a new thread. * Stations support 9-car trains. No ifs, no buts. 9-car trains. This makes the rollingstock easy to reconfigure into 3-car or 6-car trains if required. 7-car trains do not work because 7 is a prime number, therefore you cannot subdivide the train further and get even halves. The question of whether the line should break the surface and join the exhibition has been deliberately left undetermined. It is up to others to decide whether this is operationally essential or 'nice to have'. Two options exist, first to enter the exhibition line, and second, to continue under Kelvin Grove Rd and through to a future Trouts Rd line. * Underwater River Crossing. Tunnels would be estimated to be around 25 m underground and cross the Brisbane River in a submerged train tube sitting at the bottom of the Brisbane River. This should be cheaper than a BaT or CRR rock tunnel but more expensive than a bridge over the Brisbane River. "The tube was constructed on land, transported to the site, then submerged and fastened to the bottom (mostly by packing the sides with sand and gravel). This immersed tube technique is in contrast to bored tunneling, where rock is removed to leave a passage." Stockholm, Sweden also is constructing such a tunnel. The train is to run through the bottom of a lake in a submerged tube. There are other examples, see wiki link. Has photos showing the tunnel being made in Estonia, taken by ship and sunk. "Immersion is under way of the first of three 100m-long elements for the immersed tunnel section of the new US$2.4 billion 6km Citybanan rail line in Stockholm." Video. Can't work out what it says, but the pics should be self-explanatory of the concept. The video at 3:20 shows the tunnel and later sealed tunnel sections taken by ship and then sunk into the lake. BART construction from 3:00 shows underwater immersed tube construction. Can we have a naming competition? But this time when the authorities say ' no acronyms ' can they actually mean it? It turns out that Sydney has an immersed tube tunnel as well. Only in Queensland would you go to the expense of designing something three times; maybe third time lucky. The name RCRT means that, like the others, if this design goes pear-shaped, we could refer to it in derogatory terms (the Arsey River Tunnel) and move to design No.4. I like the concept. How would the current Park Road station be connected to the new underground station? The Queen Street station idea is genius. Good way to save money and a great location. The location of the main city station is key for me. I am a fan of extending the line to Alderley. Since all the equipment will be in Brisbane, surely the extra cost would not be too much? The TBM has to be dug out somewhere. Digging it out of the NWTC would involve minimal surface disruption. Look on the bright side Stillwater, we are building up a nice collection of tax payer funded booklets, brochures, videos, and discs on ' world class & best practice, very innovative ' but never to be completed projects. A nice touch for the RCRT would be to supply promotional materials on a fancy flash drive/LED light (in the shape of pipe? ... ) that way we would could turn the LED light on whilst watching a 3D animation on our smart phones as we try to navigate our way through the murky dark mess of failed transport planning in Queensland hey? like the concept. How would the current Park Road station be connected to the new underground station? The Queen Street station idea is genius. Good way to save money and a great location. The location of the main city station is key for me. I have deliberately left this question undetermined. It is for others to decide where the tunnel should go beyond Roma Street, if at all. The proposal is purely there to be the simplest, 'do minimum', value for money form of project that meets the essential objectives. I like the concept. How would the current Park Road station be connected to the new underground station? This is a rough concept only. Ideally an underground walkway would connect the new underground station with both the PA Hospital Busway and the Park Road Interchange. I think the river isn't that deep (Beacon to Beacon only shows it as greater than 5 metres), plus would you tunnel either side of the river and run a TBM through the sunken tunnel? Additionally you'd have to watch out for foundations at that depth I would imagine (I'm no engineer though). Under George St might be an option, with the station between Queen and Charlotte St (~220m according to Google maps). RAIL Back on Track (http://backontrack.org) a web based community support group for rail and public transport and an advocate for public transport passengers has floated a River City Rail Tunnel concept to replace the failed BaT project. The BaT business case showed that it was inferior to Cross River Rail on both cost-benefit and net-present value criterion. The lack of an interchange station at Park Road was also unacceptable. An alternative River City Rail Tunnel proposal broadly follows the same alignment as the BaT project, but with the bus tunnel component removed. A very high density Transit Oriented Development (TOD) would be developed at Woolloongabba. The Queen Street Mall Station would be created by re-purposing the existing underground Treasury Casino Car Park under Queen’s Park. The King George Square Busway, which was constructed in King George Square Underground Car Park is a precedent that supports the feasibility of this approach. The line would then continue to Roma Street Underground and terminate. Turn-back facilities would be provided at the end of the tunnel to allow trains to run return services. Dutton Park station would move approximately 400 meters north and merge with the existing Park Road station. The line would broadly follow a George St alignment in the CBD. Options exist to extend the tunnel beyond Roma Street. Under the proposal, all Beenleigh and Gold Coast trains would use the new line, saving around 10 minutes for all passengers. Ferny Grove Services would begin and end at Park Road Station, giving trains every 7.5 minutes or better all day at South Bank. The proposal uses 9-carriage trains rather than the BaT’s 7-carriage trains for growth and flexibility. The Queensland Government should look into an immersed train tube to cross the Brisbane River. This means that the tunnel would sit on or within the bed of the Brisbane River rather than being bored underneath it. The BART Transbay tube, Sydney Harbour Tunnel and Stockholm CityBanan Tunnel are examples of this approach. In terms of bus congestion, this is really something Brisbane City Council has caused. In our opinion, the Lord Mayor’s so-called bus network ‘evolution’ is just a public relations jingle that is now flooding the Brisbane CBD with half-empty buses during peak hour. We estimate that at four bus changes per year it would take ca. 50 years for the Brisbane Bus network to be modernised. Such an approach is unacceptable and we reject it. Money would be better directed fixing issues at the Melbourne street busway portal and other parts of the CBD busway infrastructure, purchasing high capacity 150-passenger superbuses and implementing our New Bus Network proposal that our members worked on for 12 months. That proposal would see Brisbane have Australia’s best bus network in 2 years flat, a BulimbaGlider to Bulimba and a CentenaryGlider to the Centenary Suburbs. I second Petey's sentiments - this track has to continue all the way to Bowen Hills and beyond (in terms of operational) in order to solve problems from the north. The problem is CBD capacity, not 'Merivale Bridge' capacity - much like how the problem is inner busway capacity rather than 'Cultural Centre' capacity. Also, unlike a bus network, it isn't simply enough to draw a line on the map and say 'tunnel here please'. Building a tunnel requires foundation knowledge, soil testing and a range of other things that only really the government has the time and money for. Really, the most we can do is lobby and hope for the best. Projects of this sophistication are utterly beyond the skill level of the current Qld State Govt, who have been, are and will remain, in total "flat-line" mode, until their inevitable removal from office at the next state election. The only thing this state administration will achieve - and they are well on track to doing so already - is a record number of parliamentary enquiries - there's simply no political time for real projects! Before you launch into a counterpunch, simply return here with me, just before say Christmas...next year....and let's just look at the facts, of how their going on the infrastructure front! Not sure about repurposing the Treasury's carpark as a train station. If it wins Queens Wharf, it's possibly doable (some carparks would need to remain to continue to service the Treasury Hotel. If they lose, I don't see Echo ceding any of their carpark space. Echo's lease over the Treasury site runs until 2070. Queensland Government has resumption powers, and other properties were slated for resumption in the CBD under previous proposals. King George Square is a precedent for this type of construction. Busway inserted into the bottom of a car park, car park still exists. Being an inner city location means there is less need for large car parks. It is going to be tough for any government to get a project like this funded when Canberra is unwilling to cough up. I do not hold high hopes for the ALP either, though they deserve a chance when the LNP completely bungled transport ("B" in BaT, bus reform failure, 9 then free). I can not see any government or potential government delivering the reform and invested needed for public transport. Bus reform is relatively cheap and quick to do compared to the heavy infrastructure projects. It wouldn't need to be resumed as such, it's a State Government-owned building on a long term lease. The fact that the casino lease is is enshrined in state law could make it a complex thing to negotiate with Echo, and I suspect there would also need to be a financial settlement, especially as Echo's proposed redevelopment of the Treasury (under their Queen's Wharf proposal) sees them utilising the upper level of their basement as retail space and pedestrian subway beneath Elizabeth Street. Also, if the station was to be fashioned out of the existing carpark, wouldn't that entail a very shallow railway tunnel passing close below the foundations of two of Brisbane's most precious remaining heritage buildings? I could see that resulting in a considerable engineering challenge, with the 100+ year old foundations of the Treasury and Land Administration Building surely needing to be underpinned if the tunnel was as shallow as it sounds. It would be like if the King George Square Busway went directly under City Hall. These are interesting points, though the BaT was proposed to be about where the Executive Annex is now. There are two options to this, full carpark option, or place the station under george st and use the car park side for the entrance halls etc. The tunnel would follow broadly the BaT alignment, so not much change from that. There is also significant infrastructure below the Casino building for the cash handling side of things. Wasn't it "Ocean's 13" that used a TBM to break into a casino....? There are two options to this, full carpark option, or place the station under george st and use the car park side for the entrance halls etc. I think the second option is much more doable, and could work in well with Echo's retail subway proposal. It's quite possible that while either CRR or BAT was being worked up, an immersed tube was looked into and rejected. I mean sure, immersed tube tunnels are generally cheaper and faster to build, but they are ONLY suitable for water crossings, which is maybe 300m - 400m of the entire project or 2-4 days of TBM tunnelling (given that the TBM will already be up and running). And, as red dragin points out, the use of immersed tube will have knock on effects on the remainder of the tunnel. I can think of at least two. Firstly, how shallow will the remainder of the tunnel need to be to interface with an immersed tube under the river? IIRC, soil testing undertaken for Clem7 found a water depth in this reach of the river of 5-10m with a layer of soft silt over the firm riverbed, so we might be talking a tunnel of just 10-15m deep. Cutting the approaches for this would almost certainly be more expensive than a deeper level tunnel because it would be closer to existing foundations and create more vibration at the surface both requiring more extensive underpinning; it would possibly (depending on soil conditions) make bored tunnelling unfeasible, which would trigger mass resumptions for cut and cover tunnelling; and even if bored tunnelling was feasible, a general rule of thumb is that bored tunnelling is cheaper in the solid rock encountered at deep level than in the less stable weathered rock and clay encountered at sub surface levels. Secondly, if a TBM does turn out to still work, how do you manage the transition from driven tunnel to immersed tube and back to driven tunnel? Do you massively oversize your tube so that the TBM can traverse it? What would be the cost impacts of doing this? Do you dig an extra two launch boxes either side of the river and dissassemble / transport via road / reassemble the TBM to get it around the immersed tube? What are the time and financial cost impacts of doing this disassembly / reassembly? Do you buy twice as many TBM's and start boring from both ends towards the tube, then bury them into the side wall of the tunnel once you are finished with them (a la airport link)? What is the cost impact of using twice as many machines and not being able to recover some cost by reselling them once you are done? I'm not answering any of these questions, just asking them. And if we aren't in possession of some or most of the answers to these sorts of questions, I think it's a bit silly to be championing one tunnelling technology over another. I think James has the right idea to be honest. Building a tunnel requires foundation knowledge, soil testing and a range of other things that only really the government has the time and money for. Really, the most we can do is lobby and hope for the best. No harm in raising ideas. They can be dismissed. The lack of public information means that people will float various ideas. I have spoken to a number of engineers over the years who did raise some interesting options for the rail river crossing. A relatively detailed proposal actually involved a bridge (not dissimilar to Wilbur Smith plan). 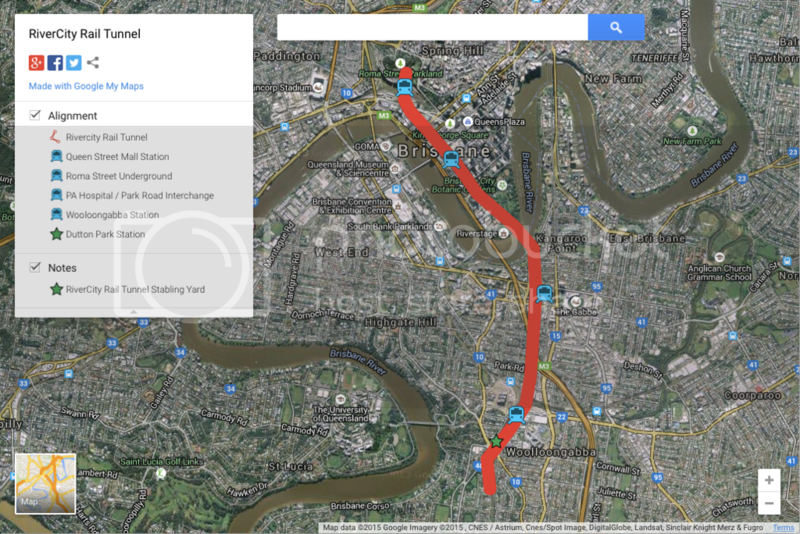 Another approach was actually for two tunnels for 4 tracks Woolloongabba to other side of Roma St. This was done on the basis there will probably only be the one opportunity to get in and do the rail tunnels. Even if the other tunnel not used immediately at least it would be there. So not everything is as cut and dried as we think at times. I feel this thread should be in the CRR working group, not here. Surely this sort of thing is exactly why the working group exists? I'm not opposed to a Queen St station in itself, but both CRR and BaT gave a station to Gardens Point, an area with no railway or busway, opening it up. Instead this concept has stations effectively duplicating the busway. To me, that doesn't seem any different to terminating all Beenleigh/GC trains at Park Road (perhaps just building extra platforms) and dumping them all on buses into the city. Why diving at Dutton Park? The beauty of CRR was diving at Yeerongpilly would remove a peak hour curfew on freight operations to the port coming from the mains, and also freed up capacity for passenger services along the Tennyson line. The Merivale Bridge isn't the only constrained section of the network, as much as possible should be freed up, particularly around major junctions such as Yeerongpilly. Remember, the GC line will be extended to the airport, with more stations and more passengers, as well as the future Beaudesert line via Acacia Ridge. Who knows what other lines might pop up in 50 years time. Just because we may not see them in our lifetime doesn't mean we shouldn't prepare the way for them, which was the issue with the BaT terminating at Roma St, it did nothing for the capacity on the north side. I can't even imagine the costs of building a stabling yard underground. The problem both CRR and BaT have faced has been funds, no way will anyone want to heap the additional costs of a gigantic underground cavern for stabling. Sure, this is just foam, but wouldn't it just have been easier to say "Hey, would a submerged tube be worth looking at for CRR"? Because other than that, it looks scarily like the BaT, minus the buses but instead transferring those costs and possibly more into an underground stabling facility, plus Park Road interchange. ^ I suspect LD's idea at Roma St was not an underground yard but something similar to Bondi Junction (ie trailing cross-overs and stow roads). No this is just a concept. It is not CRR and has its own thread. Both CRR and BaT are cancelled. There actually isn't an official proposal at current - at all. I expect CRR 1 costs are now at a $10 BN level, in particular due to risk of cancellation (political risk) for any supplier willing to do the work for the Queensland Government. The Queensland Government itself does not know what it wants to build, and there isn't money for it anyway. Secondly, if a TBM does turn out to still work, how do you manage the transition from driven tunnel to immersed tube and back to driven tunnel? How do they manage to do it elsewhere? Engineering is all about finding ways to overcome the impossible. It is true that area of town does not have a station. On the other hand, it would not be hard to walk, as people do already. Queens Park (Queen Street Mall) positioning maximises patronage and bus network connections. The original Wilbur Smith 1965 plans did consider a train station at Queen Street Mall. The BaT proposed a station, AIUI, under one of the QLD Gov Executive Buildings which would have to be demolished. Is Trad going to demolish that building or let it stand? That does not seem clear. The Albert Street option for CRR required a hotel to be demolished, the area was flooded in 2011 so and that area might be prone to some flooding. Special 'flood gates' were slated for the CRR1 Albert Street option. Queen's Park Location has none of these issues. Dig up the car park, install, cover up again, replace parkland on top. An option also exists to combine that with whatever redevelopment is happening at the time, killing two birds with one stone. And you would have brand new retail right there to support the station, whereas at Albert Street it was not clear whether there would be any activity at the station. You could grab some decent food before or after work at a Queens Park location. CRR was and is ready to go. I coukd list a few road expansion project funds that could be redirected to start it. It not an issue if funding but one of prioritisation!! Of course the tunnel should only be built with BCR above 1 and positive NPV. $10 billion divided by 5 million people divided by 30 years = approx $67 per person, per year. as well, and promote development of empty/underutilised land parcels. Other changes could be packaged so the overall tax burden isn't significantly changed. Considering the CRR was down to around the $5b mark when properly costed before Newman dumped it, $10b is quite heavily exaggerated. Time it gets built if ever will be closer to the $10B mark. Stripping of things that future proof it is all a bit pointless in the end. The dull silver lining to the delay of course is that construction costs will keep coming down now as a lot of the resources infrastructure up north is basically done and demand is lower. The BaT proposed a station, AIUI, under one of the QLD Gov Executive Buildings which would have to be demolished. Is Trad going to demolish that building or let it stand? Just pointing out that the George Street building which the BaT station was proposed to be built under – 63 George Street – is no longer owned by the State Government (directly at least). It was one of the "surplus" buildings the Newman Government sold to QIC.